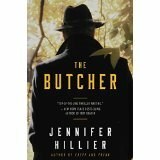 Jennifer Hillier, author of Freak, Creep and her latest, The Butcher; splits her time between Seattle and Toronto. That qualifies her for space on my blog about discovering Washington State. I read thrillers almost exclusively and hers have been some of my favorite. The Butcher definitely has to be her best work to date. The most notorious killer in Seattle history, according to the book jacket, was the Beacon Hill Butcher. But he has been shot and killed. Or has he? Recent murders show signs of the same modus operandi as the Butcher. Maybe it’s a copy cat? Or maybe the sheriff, who has now retired, got the wrong guy. Sam is researching a book about the Butcher. She has an unsettling suspicion that he may have killed her mother. Her boyfriend, Matt, a chef entrepreneur and grandson of the sheriff, makes a very disturbing discovery when he moves into his grandfather’s (the sheriff) house. I won’t reveal anymore because I want you to read the book. Hillier draws brilliant, life-like characters with everyday flaws. I can only imagine what her plotting diagram looks like during the writing process. Because she makes some swift turns with her plots, ones that keep you guessing. The story reads smoothly without excess back story and without unnecessary description. And I absolutely love her descriptions of real places in Seattle. I highly recommend all her books, but The Butcher has to be her best. You can follow her on www.jenniferhillier.org. This entry was posted in Books and tagged Creep, Freak, Jennifer Hillier, Seattle, The Butcher, thriller, Toronto on August 11, 2014 by Heather Larson. “Creep,” written by Jennifer Hillier, is a work of pure fiction or at least I hope so. Given some of the irrational behaviors reported by the news these days, it could be close to the truth. But I really think it is Hillier’s superb writing that makes the book a success. According to her Facebook page, Hillier who is originally from Canada currently resides in Seattle and the book’s setting portrays areas in and around Seattle very accurately. Named for Radiohead’s song “Creep” and appropriately mentioned throughout the book, the title is also the ultimate play on words. When professor of psychology, Dr. Sheila Tao, ends her affair with her young teaching assistant, she’s not prepared for the lengths he’ll take to make her suffer. Tao’s fiancé appears to want to end their relationship when Sheila admits to having an embarrassing addiction. Besides her fiancé, not many people would care if Sheila took off for an indefinite period of time or so it seems when she disappears. I hope that’s enough to make you want to read the book because I don’t want to spoil any of it for you. From the first page, I was hooked and spent many hours when I was supposed to be working, reading instead. Then I didn’t want it to end. I was rewarded for that. You will be, too. Although a debut novel, the writing is skilled and professional. Characters are well-drawn, easy to love or hate, and follow the paths you’d expect them to. The plot, however, will keep you turning the pages. None of the clues planted go astray and all are wrapped up neatly. Honestly, I found no fault at all with this book. Hillier’s writing keeps me reading and wanting more – that’s something I can’t define and not very many authors have it. Part of it is flow and smoothness, but some of it is a secret quality that can’t be found in how-to-write books. In August, 2012, Hillier’s new book, “Freak” comes out. I’ll be one of the first to buy it. It’s already on my calendar. This entry was posted in Books, Seattle and tagged Creep, Jennifer Hillier, Radiohead, Seattle on January 7, 2012 by admin.